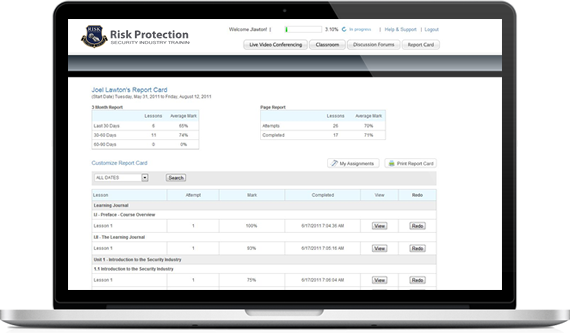 Risk Protection Group has been providing Ministry-Approved online training to students across Ontario for many years. Our leading-edge courseware and delivery method makes it easy and affordable. That’s right! More than 10,000 people have successfully completed this online training course and are working in the security industry! Yes we are proud of this. Let us help you get started today. Risk Protection has been protecting and serving for decades. Getting your license is only the first step toward a great career as a private investigator. Risk Protection hires the best! Risk Protection P.I. Training is all about helping you in your career development. Using the best technology and providing unparalleled support, you can’t help but succeed. All payments are made through a secure connection using 128 bit encryption of higher. We are PayPal certified partners, which means we do not ever store your payment details, ever! still going strong at 14 years. Pricing does not include government sales tax, Ministry testing and licensing. Students need access to a computer with Internet connection to access the training materials. No refunds are provided. Who is eligible to receive a private investigator license? If you apply online, you will be able to check the status of your application within two business days through your Service Ontario account. If you apply by mail, you can contact the Private Security and Investigative Services Program toll free at 1-866-767-7454 or privatesecurity@ontario.ca. Can I work as a private investigator while I wait for my card to arrive in the mail? You must have a valid license card to work as a Private Investigator. Working without a valid license is a violation of the Private Security and Investigative Services Act and may lead to charges. However, if you apply for a license through Service Ontario, you will be able to access a digital licence through your online account as soon as your application is approved. This is considered a valid license so long as you print this document and carry it on your person while on duty. For any additional questions, please e-mail training@riskprotectiongroup.com or call us toll free at 1-866-837-7475. Copyright © Risk Protection Group. All rights are reserved.